Something very strange has been happening. 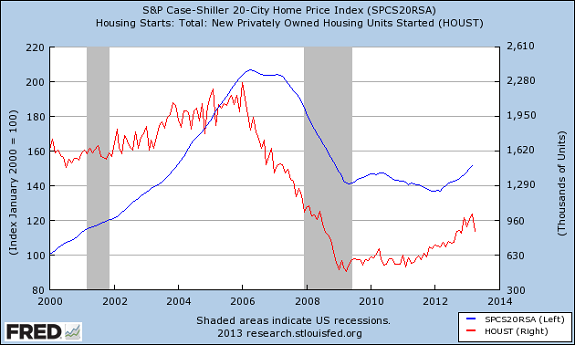 Housing, in all regards, is actually turning around. Home prices are up. Housing starts are improving. Granted, this improvement leaves the housing market looking up at the pre-crash peak, but in relative terms and compared to earlier recessionary lows, it's been more than enough for optimism. 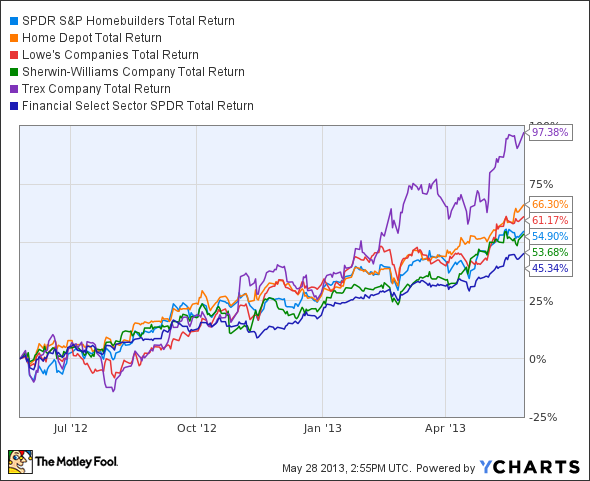 XHB Total Return Price data by YCharts. And this is just a small sample of the stocks you could have bought into during the great post-crash housing recovery. Investors have had no shortage of opportunities, from the materials going toward constructing and improving homes for sale, to homebuilders themselves, to the banks offering loans to prospective homeowners. However, one (well, two) of the most important links in the American housing chain remained locked to the ground, unmoving -- until this spring. 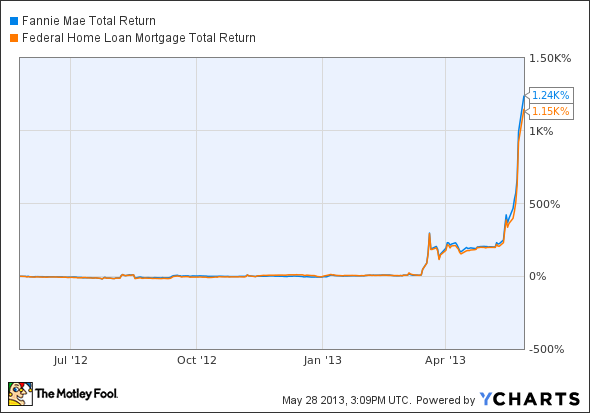 FNMA Total Return Price data by YCharts. While the rest of the market was freaking out about solar stocks and electric cars, the common stocks of America's two most notable housing government-sponsored enterprises (GSEs) languished. Of course, this was almost certainly because both Fannie Mae and Freddie Mac were placed in conservatorship as the economy melted down in 2008, which has left common shareholders without a means of redress or indeed without any expectation of sharing in the fruits of recovery. But come March, the stocks began shooting up, and they've shot up again this month. What's going on? Make no mistake: This is still a hefty chunk of change. But it is far, far lower than the $128.4 billion net cost that Propublica reported earlier this year. Now that both Fannie and Freddie have been profitable for several consecutive quarters (and by all regards appear to be on track for more profitability), we can see roughly how long it'll be before these two GSEs provide the government a profit on the bailout -- an event that's sure to bring a righteous firestorm of investor lobbying to bear on returning shares to the public. The GSEs have been making solid progress, and a trend toward greater profitability is becoming clear. 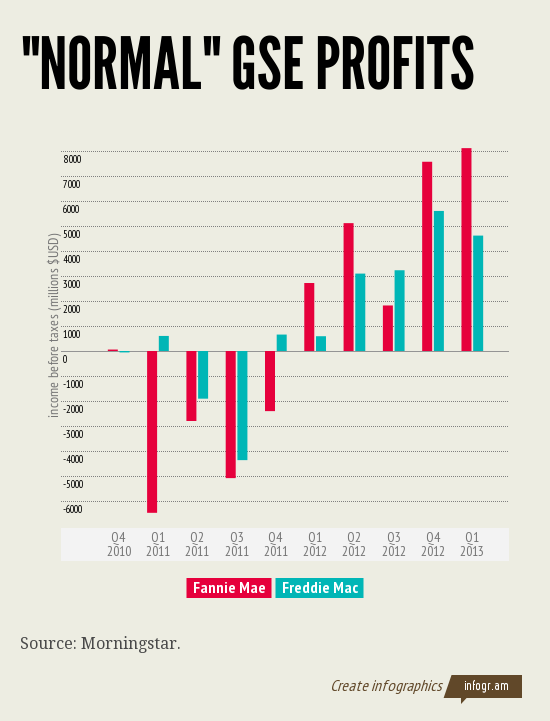 Since the start of 2012, Fannie and Freddie's average quarterly pre-tax profits have been $5.1 billion and $3.4 billion, respectively. Under these new "normal" circumstances, the GSEs have been paying out substantially all (about 90% in Fannie's case and over 100% in Freddie's case) of their profit to the Treasury, which is more or less how the new conservatorship structure works. If these averages hold up (under 90% payouts), Fannie Mae would be able to pay approximately $4.6 billion per quarter from here on out, and Freddie would be able to pay $3.1 billion. Based on the current level of outstanding bailout debt, this rate would reduce Fannie's net bailout cost to zero in just five quarters, and Freddie's in 12 -- in either case, far faster than a reported 10-year timetablefor full repayment set by the Obama administration. That's even if you count a hoped-for $50 billion profit, which would take another seven quarters of repayment between the two GSEs. It should therefore come as no surprise that a number of major hedge funds are now taking up positions in Fannie and Freddie's shares and are lobbying hard for the government to spin off its stake, again making Fannie and Freddie the publicly traded companies they once were. Even erstwhile presidential campaigner (and GSE stockholder) Ralph Nader is up in arms at the government's apparent dalliance over returning a cash cow to private ownership. With at least one writer now claiming that the Federal Housing Finance Agency (the GSEs' conservator) has breached its fiduciary dutyto shareholders, it seems likely that the Fannie and Freddie situation must be resolved far sooner than the government had hoped -- quite possibly in court, should Fannie and/or Freddie zero out their debts in the next two years or so. Thanks to stricter lending requirements, higher fees, and a lack of real competition, Fannie and Freddie appear headed for record profitability, even when discounting the impact of tax charges. We're highly unlikely to see these two enterprises vanish from the American housing picture, considering that the vast majority of American mortgages now bear the Fannie or Freddie guarantee. If they do, there's a massive amount of assets (more than $5 trillion) to be wound down first and thus accrue to shareholders -- though preferred shareholders would get first crack -- another reason why institutional investors like the GSE story right now. After an incredible rally, the remaining upside in Fannie and Freddie shares will depend largely on how effective large shareholders are in lobbying for the results they want. 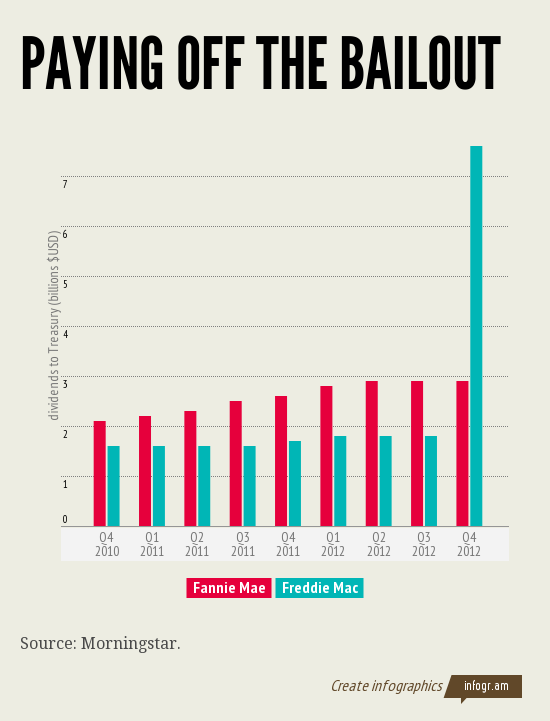 Fannie and Freddie didn't have the same strident voices in their favor as did the financial industry in 2008. Now they appear to. You might not like Wall Street, but do you really want to bet against it when it smells a good deal? The article How Fannie and Freddie Became the Greatest Stock Story of the Year originally appeared on Fool.com. Fool contributor Alex Planes owns shares of Fannie Mae. Add him on Google+ or follow him on Twitter @TMFBiggles for more insight into markets, history, and technology.The Motley Fool has no position in any of the stocks mentioned. Try any of our Foolish newsletter services free for 30 days. We Fools may not all hold the same opinions, but we all believe that considering a diverse range of insights makes us better investors. The Motley Fool has a disclosure policy.